How Far Should Anti-Trump Protesters Take It? The students at Chicago were brave and organized. But there’s also a danger to escalating confrontations. Depending on which news sources you rely on to reinforce your prejudices, what happened on Friday night at the University of Illinois at Chicago campus represented either the death of free speech, a triumph of free speech, a spontaneous expression of anger by groups fed up with being vilified by Trump, a successful attempt to deny Donald Trump a platform, or a coordinated campaign that succeeded beyond its organizers’ wildest dreams. So let’s begin with what we actually know: Since the start of his campaign, Donald Trump has singled out various groups, such as Mexican immigrants or Muslims, for derision, while at the same time deploying the language of escalating violence—as Rachel Maddow recently documented. Until last week, protesters at Trump events have appeared in small numbers—brave witnesses whose interruptions, though an annoyance to Trump, had little impact on his campaign. In Chicago, however, protesters—many of whom coordinated their actions on social media—numbered in their thousands. Although the organizers stressed the need to remain peaceful—and the Chicago police confirmed they never recommended the rally be called off—Trump himself decided to cancel the event. In the aftermath, some relatively minor clashes did occur between Trump’s supporters and protesters. Also in the aftermath, one group of Bernie Sanders supporters issued a tweet that led a particularly credulous reporter for MSNBC to claim they had been behind the protest. For his robust defense of the First Amendment, chancellor Amiridis deserves our thanks. In a democracy, we debate our opponents, or express our disapproval by protesting against them, not by silencing them. Yet even as we acknowledge these activists’ courage—a mirror image of the craven cowardice that afflicts not only Trump’s Republican challengers, but a mainstream media that seems perversely blind to the danger he represents to our democracy—we must also recognize the perils in a strategy of continuingly escalating confrontation. Marx may once have spoken of “sharpening contradictions,” but in recent decades it has always been the right who benefit from a “strategy of tension.” And though that strategy has its roots in 1970s Italy, where a corrupt state colluded with neo-Fascist politicians and provocateurs to exclude the left from power, Americans have no need to look overseas for cautionary examples. It was in Chicago, after all, the images of antiwar protesters battling with the police at the 1968 Democratic Convention helped push an outraged electorate into the arms of Richard Nixon, Spiro Agnew, and the Republican Party. Two years before that, Ronald Reagan’s crackdown on “spoiled” Berkeley student protesters turned him into a national figure. 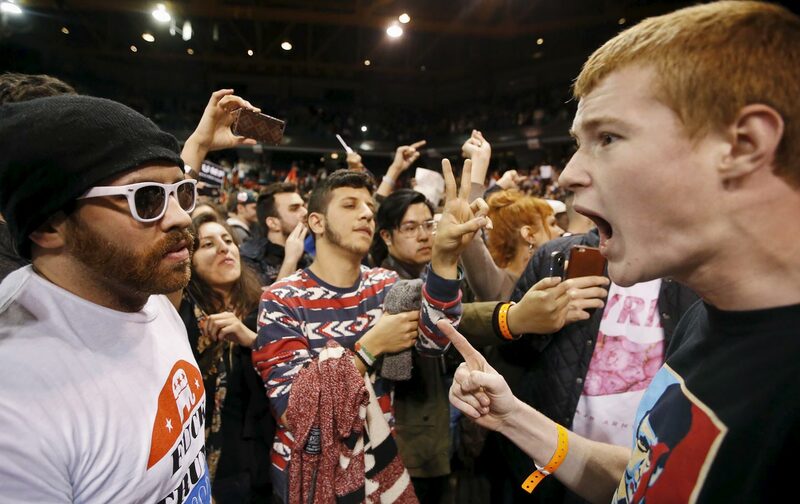 The left seldom wins these confrontations, and the urge to respond to intimidation with violence—like the temptation to reply to prejudice with “no platforming”—must be resisted. Finally, those of us who admire the Sanders campaign’s “distributed organizing” structure—the loose coordination between the Vermont headquarters staff and the hundreds of grassroots groups that do the actual work of canvassing, running phone banks, and turning out voters—need to recognize such openness also poses a danger. Last week’s events showed that if people who have every reason to consider themselves part of the Sanders campaign take actions that end up hurting Bernie or reflecting badly on his campaign, there is little that can be done to stop them. Sanders also made it clear that “our campaign did not organize the protests.” Trump of course refused to accept this, threatening to send his supporters to Sanders rallies. Should that happen, Sanders supporters would do well to remember their candidate’s robust defense of the right of peaceful protest. Because as they used to say in Chicago, the whole world is watching.